Here are more activities, using the elements of the Sensory Alphabet, that provide clues as to individual children’s strengths. Remember the idea is to provide open-ended experiences that allow diverse responses. Cover the tables with plastic. Some children will make literal pictures of day or night with sun or moon and stars. Some may draw in white chalk on the black paper. Others may just make a shiny, abstract picture. One is not better than the others. Just notate what they do. A child with a light strength may use one or more of the glittery materials or will create just using white and black materials. Another child with a strength may create a picture with strong contrast like the one above. Some children will avoid the glittery materials. Some children will use the glittery materials to create interesting textures, showing a possible texture strength as well. A child with a 3D space strength may try to make 3D forms. 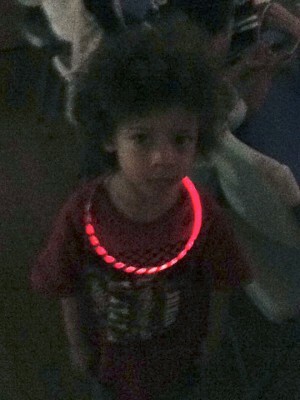 Provide the following materials: glow sticks of different sizes with connectors, tiny flashlights, aluminum foil (including foil in different colors), sparkly pipe cleaners, tinsel, small mirrors, colored pieces of acetate, small boxes, hole punch, tape, copper wire, small batteries, insulated wires, bulbs, and small shiny objects like jingle bells. Ask the children to make a light invention that can be seen in the dark. Provide the following materials: glow sticks of different sizes with connectors, tiny flashlights, aluminum foil (including foil in different colors), sparkly pipe cleaners, tinsel, small mirrors, colored pieces of acetate, small boxes, hole punch, tape, and small shiny objects like jingle bells. A child with a light strength will come up with an interesting light invention, using the new materials. One child may actually make an electrical circuit to make a bulb light up. Some children will decorate themselves, like the picture above, indicating a drama or design interest. Some children will create structures, possibly indicating an interest in 3D space. Some children will create very colorful inventions, others not, indicating more or less interest in color. Some children will make a flat invention, indicating an interest in 2D space. 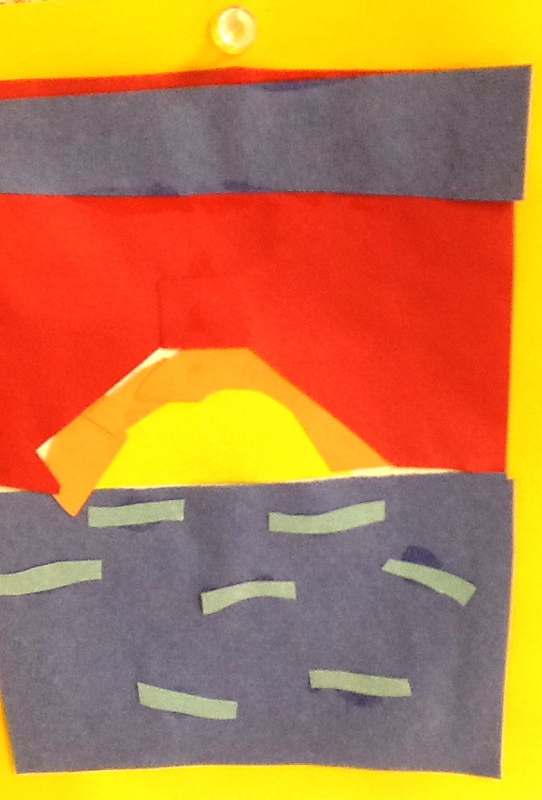 Show children how to tear construction paper to create shapes. 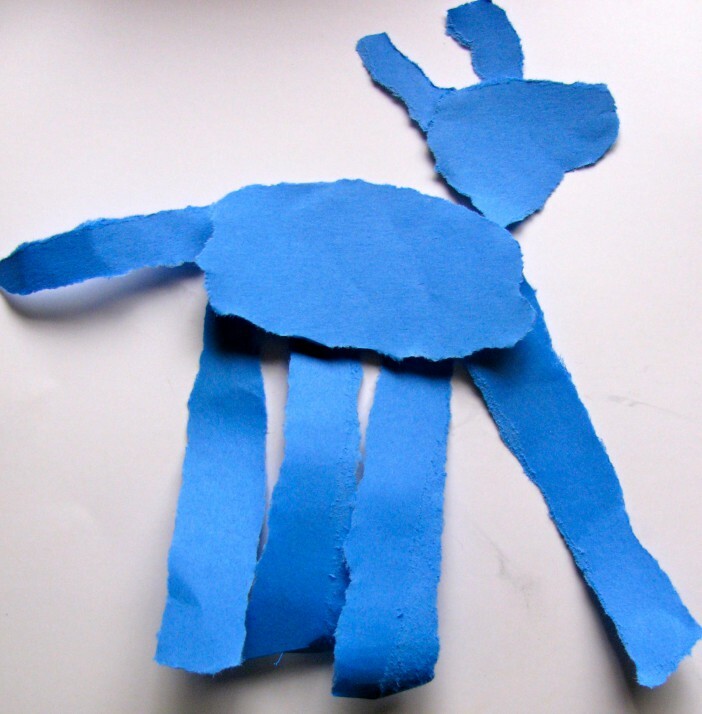 Ask children to tear shapes and then arrange them to make the shape of a person, animal or other figure. Take a photo or have children glue to a contrasting piece of paper. Note: Some children will create symmetrical forms. Others will not. One is not better than the other. Just be sure to notate what they did. A child with a shape strength will tear and arrange interesting shapes. A child with 3D strength may create a 3D figure. Some children may just shred the paper into little pieces or fail to make an arrangement, perhaps indicating a lack of interest in shape. Some children may wish to draw on the torn pieces, perhaps indicating a strength in color or line. 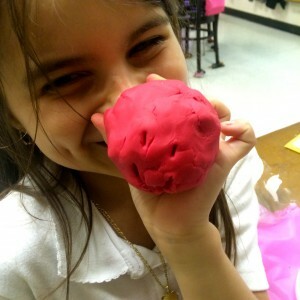 Show children how to make “balls” and “snakes” with modeling clay. Ask the children to create a person or animal from the clay. A child with a strong sense of 3D shape will create a “sculptural” or “architectural” form. A child with a strong 2D sense of shape may create a flat form. A child who creates an unstable form may not think in a 3D way. A child who creates an expressive face may have a strength in movement or other qualities.